After Kate Miller-Heidke scored 87 points in the public voting at Eurovision: Australia Decides, several readers were curious as to how the voting system worked. The total number of valid SMS votes is divided by 290 points, to determine how many of votes is equal to a point. For instance, if there were 271,021 votes, then every time a song has 934 votes it gets a point. (271,021 / 290 = 934.55 rounded to 934). This number is a quota. The amount of times the quota is reached is rounded up to the nearest whole point, ensuring the public get slightly more than the jury, as the power is in the public’s hands. score prevails, i.e. more higher scores (i.e. 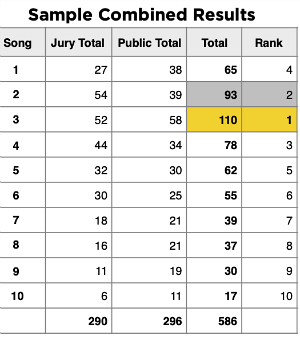 song with more number of higher scores, – so if 2 songs both got 2x12s, but one got 3x10s then that song wins etc). I do wish Eurovision across the board would ditch the jury votes and go back to straight forward televoting. The vast majority of years that gives the same winner anyway, so trust the public. 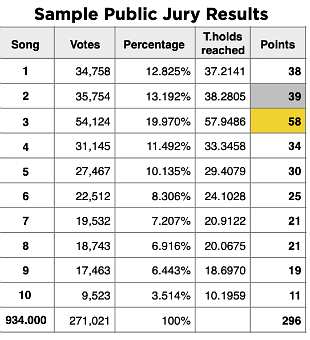 It’s a poor system to have the jury vote one way (by rank) and the public another (by total votes). There’s a total imbalance at the top of the table with the jury’s favourite scoring 48 points compared to 87 from the public. At Eurovision, each nation’s televote is converted into a rank (12 to 1 points) and then added together. 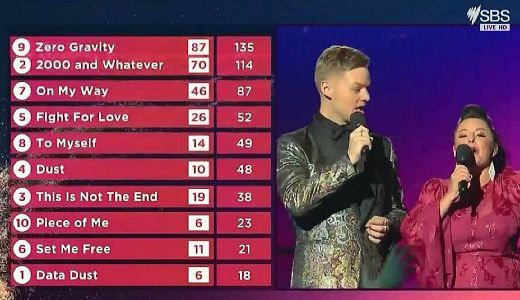 Since there’s only one televote here, you convert that directly to 12 to 1, along with the jury total score, so Kate wins on 24 points, with EF on 20, Sheppard on 16, etc. If there’s a tie then televote decides. This is the sane and fair way to do it, and the common system in most other countries. Melodifestivalen (Sweden) and Destination Eurovision (France) national finals have the same scoring system. Destination Eurovision was interesting. 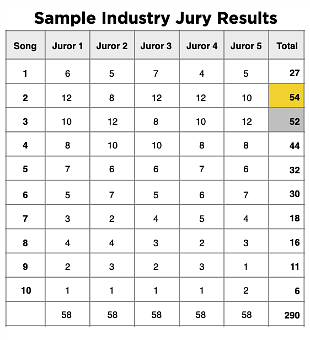 Winner got 50 pts from Jury (5th out of 8) but got 150 pts in Public vote (2nd in public vote was 63 pts). The only issue I had was I think the public vote scoring was announced the wrong way around. In Melodifestivalen, they announce the number of points then the suspense of which song they apply to. michche, Sweden and France are in the minority, and are wrong too. In a supposed 50/50 system, there needs to be an equal process in gathering the votes. Failing that, a way to equally weight them. Right now, the maximum jury vote to one song is 60 points (5×12) whereas the televote could give 290 points if every single vote goes to one song (I know, unlikely). Kate actually got 30%. The jury are also forced to vote for every song, whereas the televote can be more pointed. EG: I went 15 votes one song, 5 another. Of course, it could swing the other way, as it did in Sweden one year (might have been last year), where the televote was so even that the winning song only got like 10% of the points whereas winning the jury got 18%. Yes, I checked the results, jury gave 114 points to winner compared to 67 from televote. This is a dumb system! I get your comment Tom TV but I think it’s good to have flexibility/excitement. If the public get massively behind a song it should go. If a song got 50% of the public vote but the juries ranked it 5th, it would lose out and make a mockery of the show’s title – ie. Australia Decides. Dean, see above reply. It can be the case the televote is very even and then you have the jury choice winning. If you really want the public to have the dominant say, then get rid of the jury, or add a televote-only super final of the top 2 or 3. Sorry, completely didn’t get the whole public vote and jury vote being around the 290 votes mark on the first reading. Understand now! Was doing the calcs in my head on the night to try and work out what % of the public vote each got.